These assemblages showcase art’s power and, poignantly its limitations, to effect material transformations. Founded by philanthropists Shelley and Donald Rubin in 2010, The 8th Floor quietly and consistently hosts high quality, politically progressive art exhibitions and programs. In the space’s early years, its programming focused on Cuban art, but the 2015 hiring of Executive Director and Artistic Director Sara Reisman widened its range to encompass art and social justice in general. Reisman, who brings a sharp curatorial eye to her post, has overseen compelling exhibitions on topics such as AIDS, gender, health care, and race. The 8th Floor’s current exhibition, Sedimentations: Assemblage as Social Repair, is one of the best yet under Reisman’s direction. Featuring work by renowned artists such as El Anatsui and Mierle Laderman Ukeles, as well as accomplished younger contemporaries, including Mary Mattingly and Shinique Smith, the mostly sculptural show explores tactics of material reuse. Palimpsests of refuse, the assemblages in Sedimentations showcase art’s power and, poignantly, its limitations, to effect material transformations. El Anatsui’s celebrated sculptures perform nigh-alchemical transformations upon repurposed waste metals, woods, and clays. “Metas II” (2014) represents his signature style, with hundreds of bottle caps flattened into squares and stitched together with copper wire. Each of the artist’s bottle cap wall hangings has a dramatic shimmer and drape to it, evoking topographical relief maps, animal hides, or textiles. With its silvery color palette, Metas II looks like a length of chain mail or an oversized version of those pin impression toys sold at natural history museum gift shops. It’s tempting to view El Anatsui’s constructions as a form of highbrow recycling, especially as he sources the bottle caps from alcohol recycling centers. Yet, according to the wall text, he doesn’t consider his art to be a form of “recycling” because the term has “something political about it.” While its art for art’s sake ground may be shaky, El Anatsui’s demurral illuminates the aesthetic aspects of the repurposed materials in Sedimentations. When an object is recycled, it goes through industrial processes of transmutation that erase nearly all traces of both the original object and the industrial processes it has undergone. By contrast, incorporating an object into an artistic assemblage retains both the original object and the evidence of the artist’s hand. Preferring to work with used materials because they have a past, El Anatsui’s repurposed objects display a visible connection to their prior incarnations in a way that industrially recycled materials do not. Other artworks in Sedimentations preserve traces of both their objects’ pasts and their creators’ hands in similar, often poetic, ways. For “Gris” (2017), Samuel Levi Jones disassembled Ohio law books and stitched together (with seams showing) their tattered covers into a grid of subdued browns and grays. Jean Shin’s Spring Collection (2016) series, the result of her residency at Materials for the Arts, converts scraps from the production of designer handbags into jigsaw configurations of dyed leather. In a gilded frame that has been broken in half, Lina Puerta’s “Untitled (Tree and Frame)” (2014) blends natural and synthetic materials (concrete, wood, wire, lace, chains, feathers, Swarovski crystals) into a Frankensteinian amalgam that alludes to the inextricability of nature and culture. Michael Kelly Williams’ grafted sculptures — a rake head attached to a violin (“Wodakota,” 2017) and a bird cage bedecked with whistles and Christmas lights (“M’Boom,” 2016) — bestow ceremonial or symbolic valences upon ordinary objects. In a show filled with powerful repurposings, Mary Mattingly’s and Elana Herzog’s contributions stand out as particularly poetic and evocative. Mattingly has an entire side room dedicated to her work, much of which is derived from her recent solo exhibition at Robert Mann Gallery. Here, her spare agglutinations of rocks, minerals, industrial objects, and rope are displayed in the form of a hushed, shrine-like still life installation, Mineral Still Life (Cobalt and Nickel)(2018). On the wall above the installation hangs “Cobalt Map” (2016), a dense, arrow-filled word map of the cobalt industry’s tendrils, and “Gun Barrels” (2016), three cobalt-alloyed gun barrels. Covered in cobweb-like skeins of rope, the entire arrangement is an unsettling yet lyrical rendering of the military industrial complex’s extensive fingerprints on the material and civilian worlds. Elana Herzog’s exquisite fabric installations are also testaments to the poetic and political power of the aesthetic trace. 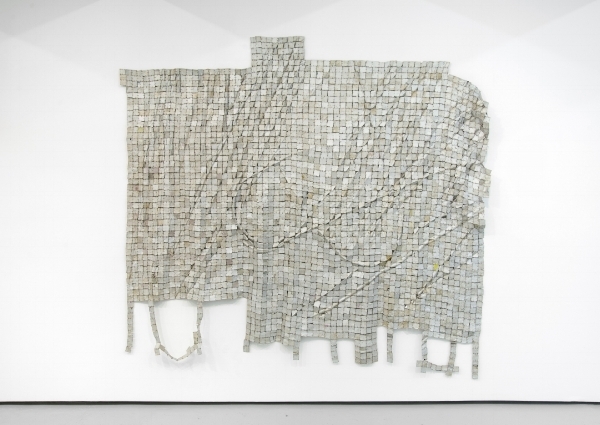 Her show-stopping Valence (2014/2018), a two-wall splay of ragged textiles affixed to construction materials, derives considerable force from its materials’ contrasting textures, as well as from the contrast between the work’s large scale and intricate details. Herzog’s “Untitled #4” (2001) — wisps of white chenille stapled to the gallery wall in the faint and tattered outline of a U.S. flag — is smaller and more subdued, but no less powerful. Originally installed in a downtown Manhattan office building immediately after 9/11, the pocked and scarred wall flag — a 21st-century update of Jasper Johns’ encaustic White Flag (1955) — expressed what has turned out to be a prescient sense of the country’s increasingly frayed political fabric. Where Herzog, Mattingly, and others incorporate traces of altered or eroded materials directly into their work, Roberto Visani’s and Michael Rakowitz’s traces are at a greater remove from their original object. Like imprint fossils, Visani’s cast iron impressions of decommissioned guns conjure the original object’s ghostly afterimage by means of negative space. The tiny sculptures in Rakowitz’s May the Obdurate Foe Not Stay in Good Health (2016) have an even more distant relationship to their originals. For the series, the artist uses Middle Eastern newspapers and packaging to make replicas of objects looted from Iraq’s National Museum in the aftermath of the 2003 U.S.-led invasion. Of all the work in Sedimentations, Rakowitz’s replicas most literally embody the exhibition’s subtitle, “assemblage as social repair.” His series attempts to reconstruct a vast cultural heritage of over 7,000 lost or destroyed objects. The endeavor has a deliberate sense of futility to it, which derives not only from the project’s impractical scope but also its method and materials. The sculptures’ rough-hewn papier-mâché construction makes no effort to pass them off as plausible copies of their well-wrought ceramic, glass, and alabaster originals. Gestures of solidarity rather than supplementation, these replicas — which succeed as artworks by failing to convince as copies — highlight one of art’s reparative limits: broken pieces cannot be reassembled to exactly recreate the original whole. Shinique Smith’s and Maren Hassinger’s contributions to the exhibition evince a poignant acceptance of this limit. Smith’s lumpy and knotted fabric bundles, which call to mind a homeless person’s bindle, don’t try to salvage or redeem excess textiles so much as accentuate their abjection. Hassinger’s Pink Trash (1982) also puts a visual accent on waste. For the performance, the artist collected white pieces of garbage from New York’s Prospect, Van Cortlandt, and Central Park, painted the garbage pink, then placed the painted garbage back near where she found it. Like a chemical reagent applied to crime scene fingerprints, the pink paint renders visible the traces of misconduct. More than recycling or repairing material objects, Sedimentations’ assemblages poetically preserve — even document — their traces. The exhibition’s title concept, an allusion to Robert Smithson’s 1968 essay “A Sedimentation of the Mind,” captures the sense in which visual art can function as a metaphorical geologic record of human activity and its byproducts. This uncommon conception of aesthetic assemblage offers a suggestive vantage point from which to contemplate its historical antecedents, from Picasso’s incorporation of objects such as newspapers onto canvases, to Robert Rauschenberg’s combines, to Arte Povera’s quotidian repurposings, and beyond. The inclusion of Mierle Laderman Ukeles in the exhibition — whose works are the least sculptural and most documentary here — drives home the point. Two videos, Waste Flow (1979-1984) and Sanman Speaks(1977-1985), chronicle her groundbreaking Touch Sanitation (1978-1980) performance, in which the artist shook hands with over 8,500 New York City Sanitation workers in an effort to appreciate and destigmatize their labor. A large grid of color photographic prints, and sundry text-based archival materials, depicts Touch Sanitation in other media. 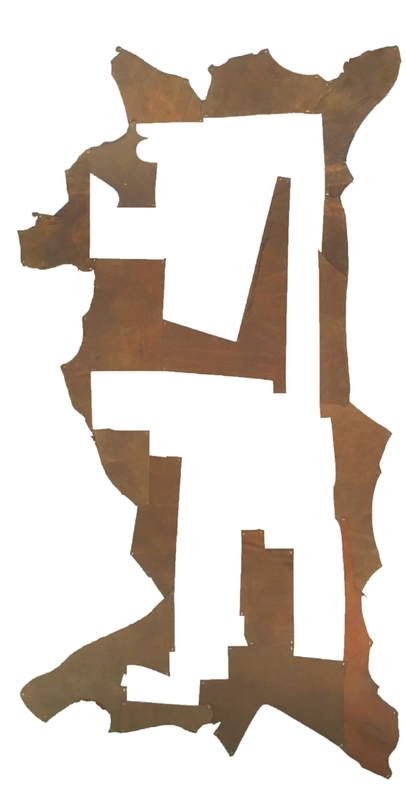 In an exhibition filled with artworks comprised of leavings and debris, Laderman Ukeles’ work is a smart and apt inclusion. But the surprise in seeing her extraordinary work alongside so much thematically related assemblage is how arid the contrast renders Conceptualist strategies of documentation. Conceptual art — and, to a lesser extent, performance art — relies upon the textual and photographic document, as a noun, to preserve traces of an otherwise immaterial or fleeting artwork. With tactile immediacy, Sedimentations’ assemblages document, as a verb, the residue of cultures that — whether with garbage, guns, or laws — have found no shortage of ways to tear themselves and others apart. Sedimentations: Assemblage as Social Repair continues at The 8th Floor (17 West 17th Street, Chelsea, Manhattan) through December 8.